The Dana Point Grand Prix is always a highlight of the season and the 2014 addition was no exception, with fast racing and big crowds throughout the day. With an expo area, beer garden and ocean views the venue has become a SoCal favorite. The Pro men’s race was the main event that featured some heavy hitters with United Healthcare and Team Novo Nordisk. United Healthcare had a good train going with several laps to go, but Daniel Holoway (Athlete Octane) managed to derail it to take the win. Luke Keough (UnitedHealthcare) followed in 2nd with Fabrizio VONNACHER (KHS-Maxxis-JAKROO) in 3rd. 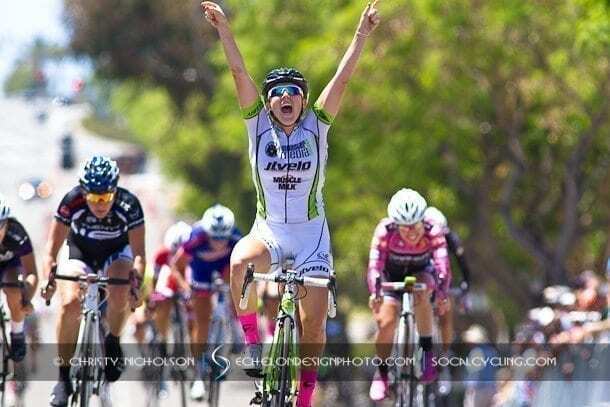 The women’s race saw Shelby Reynolds (Monster Media) take the win followed by Mary Maroon (TWENTY16 Pro Cycling) in 2nd and Angelica FRAYRE (Incycle / Full Circle Cycling) in 3rd. A bad crash happened in the sprint that took out several riders that required an ambulance for their injuries. In the Masters 35 + race, multiple DPGP winner Charon Smith (Surf City Cyclery / Sterling BMW) took another win ahead of Aaron Wimberly (SPY GIANT RIDE p/b MRI) and Kayle Leo Grande (Surf City Cyclery / Sterling BMW) in 3rd.